Adam Sandler once said on Jimmy Kimmel Live that some of his movies are just paid vacations. He was referring to Blended and 50 First Dates, the latter which was shot in Hawaii on Sandler’s suggestion. Critics of his movies have also wondered if he purposely asks that each of his characters only wear t-shirts and baggy shorts so that he can be comfortable on set. Whatever you think about his movies, it’s obvious that Sandler is a guy who does what he wants, creates what he wants, and emphasizes fun over anything else. His films are juvenile for sure, inarguably ridiculous, and seem to require little effort on his part. But are we just a little bit jealous of the guy for being paid to be a loveable idiot? Watching Pixels, yet another silly Happy Madison production, I’m convinced that the joke is on us, that Sandler is some sort of comedic genius, if only in the way he has tricked us into funding his enviably entertaining lifestyle. Back in the day, if a kid wanted to play video games he went to the arcade. Pac-Man, Asteroids, Defender, Q*bert, Centipede; these were the A-list games that figure into so many childhood memories, especially for Brenner and his friends Cooper & Ludlow. Brenner was an arcade champion, at least runner up, never quite defeating Eddie the Fireblaster but securing his place as a gaming legend. But that was a long time ago, and now he’s just a nerd who knows a lot of useless information about old arcade games. Well, it’s about to become useful, because aliens in the form of pixellated characters have just attacked Earth. That’s right, game on, and we had better defeat them before they defeat us or out planet it forfeit. Brenner & his team come together to outplay the aliens in a winner-take-all match that will decide the fate of the galaxy. Adam Sandler has one setting when it comes to his style of humor, and that dial is securely fixed at ’10-year-old’. I won’t claim that he can do nothing else, because I’ve seen him show heart in The Wedding Singer, been blown away by him in Punch-Drunk Love, and witnessed his dramatic work in Men Women & Children. But as a comedian, you know exactly what you’re going to get, either pre-teen poop jokes or middle-school insult contests. That’s what the guy thinks is funny, and that’s what we see time & again whether he’s acting, producing, or writing. His comedy is juvenile, simple, sometimes crass, and always over-the-top, but we continue to watch his films because, apparently, we all need a little downtime and Sandler definitely gives that to us. Whether you’re a fan or not, and I wouldn’t really count myself in the former category, you’ve got to give him some credit; the guy makes people laugh and, for a schlub, has made himself one hell of a career. Now, on to the movie. The best and most successful part of the story was the arcade element. Not only did the film do a great job highlighting the old games and helping you remember those days gone by, but it brought the characters back to life in a way that was extremely fun to be a part of. Donkey Kong, Burger Time, Tetris; they were all back, all alive, and all wanted to kill us, which somehow didn’t make them any less cool. Unfortunately, as much as I’d like to stop right there and enjoy the memories, there was also some acting and dialogue in the film and that was generally terrible. What can you expect from Sandler, James, and Gad other than doofy line delivered doofily, I guess, but it would have been a nice surprise had things turned out differently. Peter Dinklage was pretty awesome as a hateable old gamer with a Serena Williams obsession, but putting him aside, no one stepped up with an original character who could help save the movie from the humans who were messing up the excellence of the CGI arcadians. 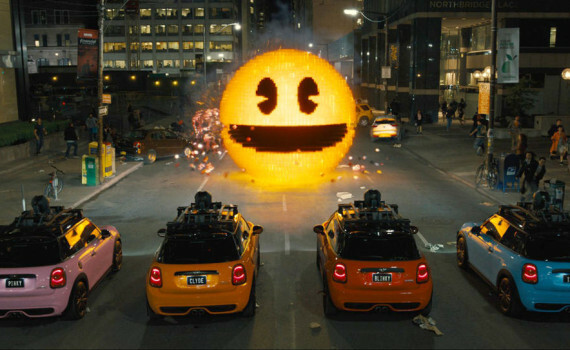 Pixels is exactly what you should imagine from a combination of Adam Sandler and Pac-Man; flat jokes, cool cubes, and audiences paying for a group of friends to have a kind of fun we can only dream about.